For some reason, picture books keep on popping up here at Government Book Talk. Just the other day I blogged about a Marine Corps book of photos taken in Afghanistan. Today, it’s the National Park Service (NPS), with a splendid collection of photographs taken throughout the NPS National Capital Region. 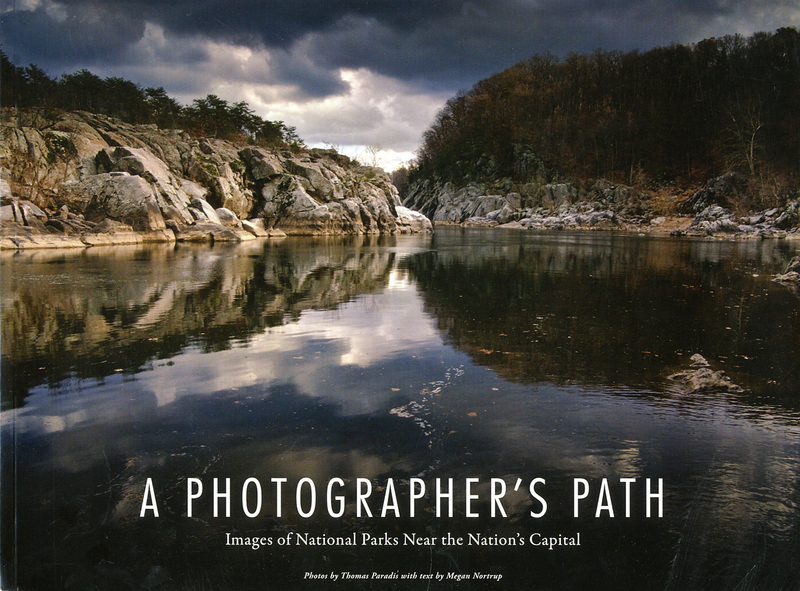 A Photographer’s Path: Images of National Parks Near the Nation’s Capital is a winning collection of images highlighting nature and history in the Greater Washington DC area. The photos, all taken by Tom Paradis of NPS, highlight the beautiful (a royal red cardinal flower with ascending blooms of scarlet, shot in DC’s own Rock Creek Park), the bizarre (a leopard/tiger-patterned stalk of the grimly named American cancer-root, taken along the George Washington Memorial Parkway), and even the glitzy (neon lights illuminating the restored amusement park arcade façade at Maryland’s Glen Echo Park). As a longtime parks visitor and Old Dominion resident, I particularly enjoyed the photos of Dyke Marsh, a wetlands paradise within shouting distance of Alexandria, Virginia. There’s a really cool shot of a verdigrised cannon at Manassas National Battlefield Park, and this park also is represented among the nature photos. Because the photographs are really the raison d’etre of this book, text is minimal, but Megan Nortrup of NPS has done a nice job of using a minimum of words to evoke the maximum mystique of each image. A Photographer’s Path is really an extraordinarily attractive publication and a testimony both to the talents of Government employees and the marvels of America’s National Parks, even in so urbanized an area as this one. You can get a copy of this brand new book here. This entry was posted on Wednesday, November 24th, 2010 at 9:20 am and is filed under National Park Service. You can follow any responses to this entry through the RSS 2.0 feed. You can leave a response, or trackback from your own site. Tom has a wonderful eye and his pictures are amazing. This book has amazing close ups and awe inspiring vistas. Everything I look through A Photographer’s Path I’m transported to the beauty that is around us. Heck, I just want to put on my hiking books and grab my camera. It’s amazing what kind of treasure suddenly appears on Government Book Talk, this would definitely be one of those amazing finds. The front cover is already a great piece of work and there is definitely more inside. A friend of mine recommended this book to me and I also wanted to know more about it before purchasing. I think this will be a good part of my collection. Would have been nice to have some photos from the book in the blog. The links in the blog article are to the web sites of the various NPS parks cited. This book is nbot available online, so I couldn’t link to the photos, and my thumbnails don’t really do justice to images. I hope the cover image conveys at least a bit of their quality. “PHOTOGRAPHER’S PATH ” IS REALY AN EXTRAORDINARY ATTRACTIVE PUBLICATION!IN ADDITION IT IS MARVELOUS WORK!I WOULD LIKE TO ADD IT , IN MY LIBRARY!